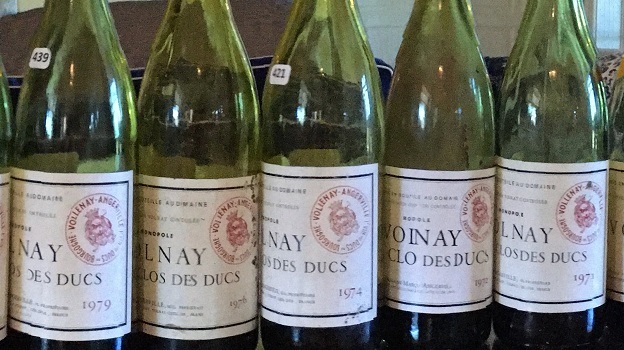 This past July I organized a vertical tasting of d’Angerville Clos des Ducs. It’s a wine I’ve loved and followed for many years. 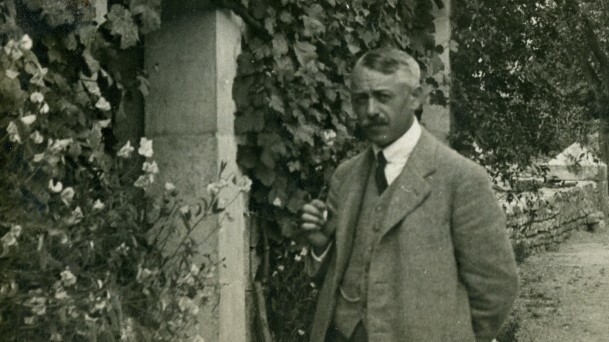 The Domaine is, of course, one of the most illustrious in Burgundy, thanks in part to the efforts of the current Marquis’ grandfather, Sem d’Angerville, who stood up to the négociants in the 1920s in response to their corrupt blending practices and who subsequently became one of the first to estate bottle his wines. On Sem’s death in 1952, he was succeeded by his son Jacques, who further burnished the reputation of the estate. Guillaume, the current Marquis d’Angerville, enjoyed a successful career as an investment banker in London, New York and Paris, taking over the estate when his father died unexpectedly in the summer of 2003. It was a real baptism by fire, as 2003 was the hottest vintage on record. Clos des Ducs is a monopole, a picturesque, walled vineyard unfurling from the tree line at the top of the village of Volnay. The drainage is superb and an underground spring near the center of the vineyard helps keep the vines active in drought years. The soil, relatively deep, is a complex mixture of argilo calcaire and marne blanche. Clos des Ducs’ position on the northern hill of Volnay, facing east to south-east, is unique in the village. Many fans of this wine have suggested that it merits Grand Cru status. Certainly it has the longevity of many Grand Crus; in fact it is famously slow to blossom and show all of its colors. In bigger, more structured vintages, the wine can seem remarkably young, even after twenty years of aging. For all its structure, Clos de Ducs is not necessarily a massive wine, rather it is more linear and focused than Premier Crus farther down the slope and almost always shows a distinct mineral streak. Guillaume d’Angerville likes to refer to it as “Cistercian,” (meaning, I take it, that it is typically reserved rather than opulent, the Cistercians having broken away from the Benedictine order with the goal of returning monastic life to the asceticism and simplicity espoused by St. Benedict.) This is a wine for connoisseurs and lovers of classical Burgundy; even in hot vintages, Clos des Ducs will never be mistaken for a New World Pinot. I’ve been tasting at the estate and collecting Clos des Ducs for a number of years. When Guillaume d'Angerville told me he was going to be on the East End of Long Island I decided it was time to conduct a vertical. 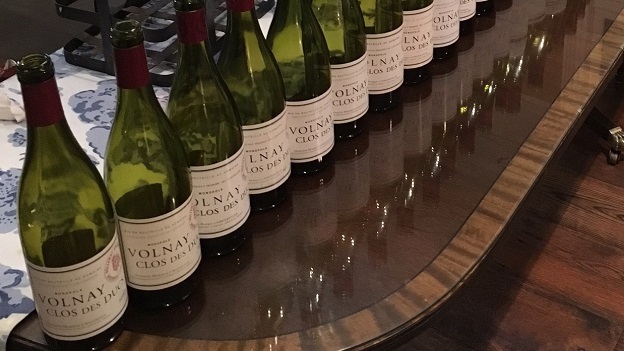 Over the years I’ve discovered quite a few other Burgundy lovers who share my enthusiasm for the d’Angerville Volnays – particularly Clos des Ducs – many of whom aren’t otherwise all that interested in the reds of the Côte de Beaune. We constitute a bit of a cult, so it wasn’t hard to round up tasters for this event. Many of the wines came from my own cellar, others from fellow collectors including Doug Barzelay, David Blank and Roger Stein. Guillaume d’Angerville shipped over a few treasures ahead of the tasting, including a 1920 Clos des Ducs and a 1937 Volnay Chevret, from a vineyard no longer owned by the domaine. David Beckwith, of Grand Cru Consulting, performed sommelier duties and arranged the wines in flights based on perceived vintage similarity, though I will for convenience sake list the wines chronologically. One of the qualities demonstrated by our tasting was a remarkable consistency. Many so-called "off vintages" showed extremely well. Vintages such as ’95, ’92, ’74, and ’72 all greatly exceeded our expectations; there were a few disappointments, including bottles of ‘99 and ’71, two legendary Ducs, which may have had storage issues.